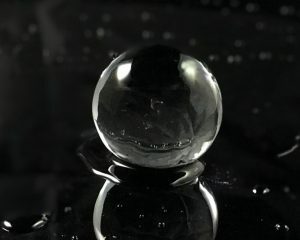 What makes an ice ball so fascinating? I don’t know, something about the spherical refraction of the light that passes through it give it an aura unobtainable by other kinds of ice. Use an ice ball when enjoying your favorite spirit to get the perfect flavour! Our ice balls are machine formed from our Artisan Ice. First we cut the artisan ice down into a manageable shape before sending it through our top secret ice ball making machine. Ice balls are the choice of liquor connoisseurs and mixologists who prefer a lightly chilled drink. Unlike tubed ice, ice balls have significantly less contact area with the drink and therefore will allow you to enjoy your drink with significantly less dilution. Similarly, dropping an ice ball into your coffee will allow you to drink your coffee with minimal dilution. Just put it in your drink whether scotch on rocks, Jack & Coke or a Gin & Tonic and enjoy a better tasting drink today!